Sections:Jump to a section by clicking on its name. Lutein and zeaxanthin are believed to protect the macula of the eye (in the retina) from damage (see What It Does). Many people consume relatively small amounts of lutein and zeaxanthin in their diets or have low levels of lutein in their blood; for them, taking a lutein supplement can slow the progression of age-related macular degeneration — although it won't improve the condition (see Getting lutein and zeaxanthin from food). A dose of 10 mg of lutein appears to be better than a lower dose (6 mg). Higher dose products (e.g., 20 mg to 40 mg) are common, although it is not known if a higher dose is better. Nevertheless, 20 mg has been shown to be safe in a 6-month study. It's not clear whether the "free" or "ester" form, or a natural or synthetic source, is better and it is not clear if there is added benefit with zeaxanthin. Lutein and zeaxanthin at a reasonable dose (10 to 20 mg) can be obtained for as little about 15 cents per day (see What CL Found). Other ingredients, particularly zinc, may be beneficial in slowing the progression of age-related macular degeneration. Vision formulas with these ingredients as well as lutein and zeaxanthin are available, although significantly more expensive than getting lutein/zeaxanthin alone. The formula with the strongest clinical evidence is Bausch + Lomb PreserVision AREDS Lutein (see What CL Found — Vision Formulas). One vision formula failed testing, containing only 9% of its listed lutein. To enhance absorption, it is best to take lutein and zeaxanthin supplements with a fatty meal. However, consumption of certain foods and supplements may decrease absorption of lutein and zeaxanthin (see Concerns and Cautions). Lutein and zeaxanthin are members of the carotenoid family — a group of natural plant pigments that includes beta-carotene and lycopene. Lutein and zeaxanthin have identical chemical formulas and are isomers (they have slightly different molecular structures). They, along with a stereoisomer of zeaxanthin known as meso-zeaxanthin, are the only carotenoids found in high concentration in the macula of the eye and surrounding retinal tissue, where they may protect the eye from damaging light. Lutein and zeaxanthin are available from a wide variety of foods and it is believed that meso-zeaxanthin is synthesized in the retina from lutein. However, most adults in the U.S. consume less lutein and zeaxanthin than the amount believed to lower the risk of macular degeneration. Consequently, dietary supplements are often used to increase lutein and zeaxanthin levels. The macula is an area within the retina of the eye that is responsible for conveying fine color images to the brain. The macula can degenerate with age, resulting in loss of vision. Age-related macular degeneration is the leading cause of blindness in the U.S. More than nine percent of people in the U.S. over age 40 show some form of macular degeneration and it affects 27% of adults 65 and older. It is believed that lutein and zeaxanthin, both of which are anti-oxidants, protect the macula by scavenging potentially damaging free radicals and absorbing certain high-energy light. Studies of populations generally show that people who get the most lutein and zeaxanthin from their diets tend to have lower rates of macular degeneration. One double blind, placebo controlled study (Richler 2004) showed that after one year of daily supplementation with 10 mg of lutein (or 10 mg of lutein plus a mixture antioxidants, vitamins and minerals) ocular pigment increased and vision improved in people with atrophic age-related macular degeneration. A subsequent study failed to find benefit with lutein, but it used a lower dose (6 mg daily) and involved fewer people (Bartlett 2007). Additional human studies suggest that among people with age-related macular degeneration, those with low blood levels of lutein may be more likely to benefit from taking lutein supplements. Even in people with healthy eyes, the density of macular pigment does not seem to increase with lutein/zeaxanthin supplementation unless the density was low to start. This was seen in a 6-month study in Japan using FloraGLO or XanMax (1 capsule daily, each containing approx. 10.5 mg lutein and 1 mg zeaxanthin). There was no increase in macular pigment density in most people in the study, except those with low density at the start (Obana, PLoS One, 2015). In a study among 120 men and women (average age 56) in France with a family history of age-related macular degeneration, but normal macular pigment density and no other risk factors or signs of the disease, supplementation with a capsule containing lutein (5 mg), zeaxanthin (1 mg), vitamin C (90 mg), vitamin E (15 mg), zinc (7.5 mg), copper (<0.5 mg), and resveratrol (0.5 mg), as well as 33 mg of fish oil, taken twice daily for six months, did not increase macular pigment density compared to placebo (Korobelnik, JAMA Opthalmol 2017). The message: If macular pigment density is not low, lutein and zeaxanthin may not help. Some research suggests that pigmentation may continue to improve over several years of supplementation. One clinical trial compared three different formulations in men and women with early age-related macular degeneration over a 3 year period: 20 mg of lutein plus 0.86 mg zeaxanthin (Ultra Lutein, Natural Organics, Inc.), 10 mg lutein plus 2 mg zeaxanthin and 10 mg meso-zeaxanthin (Macushield, Macuvision Europe Limited), and 3 mg lutein plus 2 mg zeaxanthin and 17 mg meso-zeaxanthin (not commercially available). The study found that all three formulas significantly increased macular pigmentation over the first year, with no further gain in the second year. However, during the third year, there were further increases in pigmentation among those who took formulas containing meso-zeaxanthin. Over the course of the 3 year study, vision remained stable (no improvement and no decline in vision) with each formula, and no progression to advanced macular degeneration occurred (Akuffo, Eye 2015). In addition to lutein and zeaxanthin, other ingredients may improve macular degeneration. See the section Eye Health Supplements. A preliminary study suggests that lutein may help treat retinitis pigmentosa (Bahrami 2006). Population studies also suggest a reduced risk of developing severe cataracts (clouding of the lens of the eye) in people consuming higher amounts of lutein in their diet. The AREDS 2 study found that supplementation with lutein and zeaxanthin did not have a benefit except in those with the very lowest dietary intakes of lutein and zeaxanthin — among this group, the number of people requiring cataract surgery was reduced by 32%. There is also preliminary research suggesting that lutein and zeaxanthin may help protect skin from sun damage. Increased lutein intake has also been associated with a lower risk of colon and breast cancer. Lutein and zeaxanthin are also found in very small amounts in the brain and preliminary evidence suggests they may have a positive effect on brain functioning. A placebo-controlled clinical study found that when healthy young people (in Georgia, U.S.) took a daily supplement containing zeaxanthin (20 mg as Eye Promise Zeaxanthin from ZeaVision, Inc., which funded the study) or zeaxanthin in combination with lutein (26 mg and 8 mg, respectively, as EyePromise vizual EDGE), they showed an average 20% increase in the speed of a type of visual processing required to discriminate a light source as flickering versus steady. This type of visual processing is typically slowed by aging, and faster processing tends to be positively correlated with, for example, improved sports performance and driver safety, reading speed, and executive cognitive function (Bovier, Arch Biochem Biophys 2015). In addition, a placebo-controlled study in Ireland among healthy adults with low central macular pigment density (under 0.55 optical density units at 0.23 degrees of eccentricity, as determined by eye exam) found that taking a formulation of 10 mg of lutein, 10 mg of zeaxanthin, and 2 mg of mesoxanthin daily for 12 months lead to improvements in episodic memory (e.g., remembering where you parked your car) (Power, J Alz Dis 2018). Another study in Georgia among a small group of healthy young college students suggested that lutein and zeaxanthin supplementation may reduce psychological stress. Supplementing with softgels providing 13 mg or 27 mg of a combination of lutein/zeaxanthin (83%/17%) modestly reduced psychological stress scores and levels of cortisol (a stress hormone), while placebo did not. The improvements were statistically significant for the high dose at 6 months, and for both high and low doses at 12 months. Blood samples indicated that the students had low consumption of lutein from their diets and, as expected, the supplements increased macular densities in students' eyes, which, the researchers speculated, might indicate increased levels of these compounds and an anti-oxidant effect in students' brains as well. The study was funded by Omniactive, which sells Lutemax lutein (Stringham, Nutri Neurosci 2017). A study by the same researchers which was also funded by Omniactive suggested that daily supplementation with 24 mg of a combination of lutein, zeaxanthin and mesozeaxanthin (at a ratio of 83%:10%:7%, respectively) daily can benefit people who spend prolonged periods of time in front of computer, phone, or tablet screens. In the study, 35 healthy college-aged men and women (average age 21) were given the supplement daily for six months. Over that time, compared to a group which received a placebo, headaches were reduced by 35%, eye strain was reduced by 20%, and eye fatigue was reduced by 30%. Participants also reported 20% fewer sleep complaints (Stringham, Foods 2017). There is preliminary evidence suggesting astaxanthin, another carotenoid, might help prevent eye fatigue and protect the lens of the eye against cataracts, as well as protect the stomach against ulcers, help with male infertility, and reduce risk of macular degeneration. However, more research is needed. Astaxanthin is naturally produced by a type of algae and, through the food chain, provides the pink coloration of salmon, trout, krill, shrimp and other crustaceans. (For more about astaxanthin see the Fish Oil/Omega-3 Supplements Review). See ConsumerTips for information about ingredient forms, dosage, and safety issues. See the Encyclopedia on this site for additional information about clinical studies with lutein/zeaxanthin and astaxanthin. Among the products selected by ConsumerLab.com, all but one were found to provide the amounts of lutein and zeaxanthin claimed on their labels: EyeScience Macular Health Formula was discovered to contain only 9% and 65%, respectively, of its listed lutein and zeaxanthin. All applicable tablet products disintegrated properly and those tested for heavy metals did not exceed strict limits for contamination. Passing tests of quality is just one hurdle a product should overcome before you consider using it. Other questions to be answered are: Is the dose appropriate; how does it compare on price; and, if there are other ingredients, do they make the product more or less desirable? As noted in the ConsumerTips section, a useful daily dosage of lutein for someone who does not get enough from their diet ranges from 6 mg to 10 mg and, possibly, up to 20 mg. If you already eat more than half a cup a day of green leafy vegetables, you can probably skip a supplement. If you get some greens but perhaps not enough, a supplement with at least 6 to 10 mg could help. If you don't eat green leafy vegetables, 10 mg would seem more appropriate and even 20 mg may be helpful and still safe. All of the products, except the one which failed testing, provided at least 6 mg of lutein and some provided much more — up to 40 mg.
To help compare products on price, ConsumerLab.com calculated the cost to obtain 10 mg of lutein from each product. Among supplements with only lutein, or lutein and zeaxanthin, Trunature [Costco] Vision Complex Lutein & Zeaxanthin provided lutein at the lowest cost, with a 14 cent softgel providing 25 mg of lutein and 5 mg of zeaxanthin. Vitacost Lutein also cost 14 cents per softgel, but provided somewhat less lutein (20 mg) and less zeaxanthin (about 1 mg). Jarrow Formulas Lutein is another good value at 16 cents for a softgel providing 20 mg of lutein and 1 mg of zeaxanthin. If you want a lower dose of lutein, (particularly if you already get some green leafy vegetables in your diet), consider CVS/pharmacy Lutein — a softgel costs 14 cents and provides 6 mg of lutein. Unfortunately, none of the products in this group provided a 10 mg dose of lutein. Some products contain lutein as an "ester" and some as non-esterified "free" lutein -- either form is fine. The same holds true with zeaxanthin, which is available in a synthetic form that is also acceptable. 10 mg of lutein and 2 mg of zeaxanthin, especially if you don't consume enough green leafy vegetables. Beta-carotene, often listed as "vitamin A (as beta-carotene)" on labels, is not needed and should be avoided by current smokers and people who have been occupationally exposed to asbestos. You can also skip formulas with omega-3 fatty acids from fish oil as these provide no added eye health benefit. (Omega-3 fatty acids may be helpful, however, if you suffer from certain forms of dry eye). Other ingredients, such as bilberry, were not included as part of the study and are unlikely to have additional benefit in age-related macular degeneration. (Preliminary research suggests that bilbery may improve retinal lesions in people with retinopathy related to diabetes or hypertension and it may provide a short-term improvement in night vision. More about bilberry supplements, including our ConsumerLab.com's tests of products, are found in the Bilberry Supplements Review). USANA Visionex ($1.12 per day) provides somewhat less zinc that the AREDS formula (10 mg per day), but provides a reasonable amount of vitamin C (500 mg), lutein (10 mg) and zeaxanthin (2 mg). Bausch + Lomb Ocuvite Lutein & Zeaxanthin (35 cents per day) covers the same ingredients but doesn't follow the AREDS formula, providing just 100% of the Daily Value (recommended daily intake) for vitamin C (60 mg), vitamin E (30 IU), zinc (15 mg), and copper (2 mg), as well as 6 mg of lutein (but no zeaxanthin). GNC Preventative Nutrition Eye Formula ($1.17 per day) provides 100% of the DV of the AREDS ingredients, but adds 100% of the DV of vitamin A (50% as beta-carotene and 50% as retinol from fish liver oil) and 500 mg of vitamin C — an amount close to that in the AREDS formula, and twice the lutein (20 mg with 4 mg of zeaxanthin). Lipotriad Visionary (42 cents per day) contains AREDS ingredients, some in higher amounts, along with a modest amount of omega-3 fatty acids from fish oil — although the fatty acids may have no added benefit in terms of vision, according to the AREDS2 study. Ortho Molecular Products 4Sight ($2.01 per day — making it the most expensive formula) provides 30 mg of lutein and 1.5 mg of zeaxanthin per day as well as zinc (15 mg) but also several other ingredients, such as Gingko biloba, which do not seem to have strong evidence of vision benefit. TwinLab OcuGard Plus (74 cents per day) provides relevant ingredients, including 25 mg of zinc per day and 20 mg of lutein. However, it provides a much higher amount of vitamin C — 1,500 mg per day than the AREDS formulas. You may not want to take this much vitamin C, as some research suggests that high-dose vitamin C may increase the risk of cataracts. LifeExtension MacuGuard Ocular Support is essentially lutein (10 mg) and zeaxanthin (4 mg) with an antioxidant, cyanadin-3-glucoside (from black currant extract), which animal research suggests may have some benefit for night vision (Lee, Current Eye Res 2014). An article with more information about supplement ingredients used to prevent macular degeneration is available from the Encyclopedia on this website. Listed alphabetically below are the test results for 19 supplements containing lutein. Some also contain zeaxanthin and some are formulas including other ingredients of potential relevance to vision. Ten were selected by ConsumerLab.com and nine others (each indicated with a CL flask icon) are included for having passed the same evaluation through ConsumerLab.com's voluntary Quality Certification Program. Also listed are two products which are similar to another that passed testing but are sold under different brand names. The full list of ingredients is available for each product by clicking on the word "Ingredients" in the first column. Products listed as "Approved" contained their listed amounts of lutein and zeaxanthin and met ConsumerLab.com's quality standards (See Passing Score). Click on beneath a product name to find a vendor that sells it. To find retailers that sell some of the listed products click here. Mfd. by Nature's Bounty, Inc.
Dist. by Wal-Mart Stores, Inc.
Mfd. by Puritan's Pride, Inc.
Mfd. by Vitamin World, Inc.
Dist. by Quality Supplements and Vitamins, Inc.
Dist. by Ortho Molecular Products, Inc.
Dist. by USANA Health Sciences, Inc. Tested through CL's Quality Certification Program prior to, or after initial posting of this Product Review. * Product identical in formulation and manufacture to a product that has passed testing but sold under a different brand. For more information see CL's Multi-Label Testing Program. 1 Only products that contain whole herb(s) and/or more than 250 mg of minerals daily were tested for lead, arsenic and cadmium. 2 Not tested but claimed on label. 3 Claims to contain 6 mg Crystalline Lutein, which is comprised of 76% lutein and 7% zeaxanthin. 4 Based on price listed on puritan.com. Price is for a "Buy 1 Get 2 Free" deal. 5 Based on price listed on vitaminworld.com. Unless otherwise noted, information about the products listed above is based on the samples purchased by ConsumerLab.com (CL) for this Product Review. Manufacturers may change ingredients and label information at any time, so be sure to check labels carefully when evaluating the products you use or buy. If a product's ingredients differ from what is listed above, it may not necessarily be of the same quality as what was tested. The information contained in this report is based on the compilation and review of information from product labeling and analytic testing. CL applies what it believes to be the most appropriate testing methods and standards. The information in this report does not reflect the opinion or recommendation of CL, its officers or employees. CL cannot assure the accuracy of information. Copyright ConsumerLab.com, LLC, 2015. All rights reserved. Not to be reproduced, excerpted, or cited in any fashion without the express written permission of ConsumerLab.com LLC. There is no government recommended daily intake for lutein or zeaxanthin. Population studies suggest a reduced risk of both age-related macular degeneration and cataract formation in people who get about 6 mg per day of these compounds from foods. It is estimated that the average U.S. adult consumes a total of only 2 to 4 mg per day of lutein and zeaxanthin from foods. It is possible to get from food the amount of lutein and zeaxanthin associated with a decreased risk of macular degeneration and cataract formation. As little as a half-cup of cooked kale, Swiss chard, spinach, or collard greens will provide 6 mg or more of lutein and zeaxanthin, as they are among the richest food sources. Other foods with fairly high amounts of lutein and/or zeaxanthin are corn, celery, kiwi fruit, endive, grapes, zucchini, and broccoli. Even iceberg lettuce and green peas will contribute these anti-oxidants to your diet. Specially produced eggs, from chickens fed marigold petals, may also provide high levels of lutein. Most foods contain more lutein than zeaxanthin, but pepper, oranges and orange juice typically contain more zeaxanthin than lutein. Interestingly, oranges and orange juice also provide high amounts of flavonols (a type of flavonoid) and may be particularly useful in preventing age-related macular degeneration. A 15-year study in Australia found that adults aged 50 years and over who consumed at least one orange (100 grams of edible fruit) per week had 58% reduced odds of developing AMD compared to those who did not consume oranges; consuming one orange per day had about the same effect but only with regard to reducing the risk of late-stage AMD, and consuming orange juice daily (versus no orange juice) only significantly reduced the risk of early stage AMD. There were no significant benefits regarding AMD associated with consumption of tea, red wine, or beer, which are also high in flavonoids (Gopinath, Am J Clin Nutr 2018). The bottom line: Try to eat at least one orange per week. Also, try to have fish at least once a week, as this is also associated with a reduced risk of AMD. For an extensive listing of the amounts of lutein and zeaxanthin in foods, see the USDA National Nutrient Database. Based on population studies, supplements were often designed in the past to provide 6 mg of lutein. But more recent research specifically using supplements showed that 10 mg of lutein appears to be an effective dose for improving vision in people with atrophic age-related macular degeneration — although it does not seem to prevent disease progression. Consequently, some products now provide 10 mg of lutein, along with lesser amounts of zeaxanthin. Some promotional literature on the Internet suggests that a higher (20 mg) dosage should be taken by people with advanced macular degeneration. There is no evidence yet to support this recommendation, although it is known that larger doses do increase levels of these anti-oxidants in the blood. Research from the National Eye Institute using supplements containing free form lutein (see "Forms of Lutein: Free vs. Ester" below) show that normal adult blood serum levels of lutein double with a daily dose of just 2.5 mg, almost triple with 5 mg, and quadruple with a daily dose of 10 mg. This would suggest, however, a diminishing return with even higher doses. Nevertheless, a six-week study using 20 mg of lutein in people suffering from retinitis pigmentosa, another sight—robbing condition, experienced improvements in their vision (Bahrami 2006). Be aware that some manufacturers sell supplements providing very small amounts of lutein — often just a fraction of milligram — sometimes as part of a larger formula. The multivitamin Centrum Silver, for example, provides just 0.25 mg (250 mcg) of lutein. While this allows the product to promote lutein as an ingredient, it is questionable whether such a small dose provides health benefit. If you already get a high amount of lutein from your diet, evidence suggests that you may not get additional benefit from supplements. When using supplements, lutein levels in the blood rise over time, peaking at 3 months. Once stopped, blood levels fall over a period of months and return to normal in about six months. Lutein in supplements comes as either lutein "esters" (such as the trademarked XANGOLD lutein) or the non-esterified "free" form of lutein (such as the trademarked FloraGLO lutein). The LutiGold brand contains lutein (form not listed; however ConsumerLab.com was informed by maker, NBTY, that it is non-esterified), along with a small amount of zeaxanthin (800 mcg per 20 mg of lutein). Lutein and zeaxanthin found in green vegetables, fruits and egg yolk exist in the free form. Much of the lutein in supplements is extracted from marigold petals, which naturally contain lutein in the esterified form, although this can be converted to the free form through a process called saponification. Both forms are equally well absorbed by the body, but are best absorbed when taken with fats or oils (for this reason, some lutein supplements contain oils such as safflower or soybean oil). Consequently, it is generally recommended to take lutein supplements with meals -- preferably high-fat rather than low-fat meals. The capsule size of various brands of lutein may differ, even when they provide the same amount of lutein, depending on the amounts of other ingredients they contain, including inactive ingredients such as oils. Products often combine lutein and zeaxanthin with omega-3 fatty acids, vitamin E, Zinc and other ingredients that have been used the AGE-Related Eye Disease study (see "Vision Formulas Used in AREDS Studies," below), resulting in a larger pill or capsule. Lutein may have an odor --- described by some as similar to vase water in which flowers have remained too long. This is a result of the extraction and concentration of lutein esters from marigold flowers which, themselves, can have a rough odor. This odor is normal and may be particularly strong in products containing higher amounts of lutein, such as 20 mg. The odor tends to be greater with esterified lutein than with free form lutein. The odor may be reduced by formulating the lutein within materials such as microencapsulated beadlets. Most zeaxanthin is derived from plants, but, a synthetic form has become available in supplements in recent years. An analysis of the safety of this form was recently performed by the European Food Safety Authority. It concluded that synthetic form is safe and that a daily dose up to 53 mg does not raise safety concerns (EFSA Journal 2012). Saffron, derived from the stigma of the crocus flower (Crocus sativus), is sometimes added as an ingredient in vision supplements — although it was not part of the AREDS formulas discussed below and is not an ingredient in any products in this Review. Several small studies by the same group of researchers in Italy suggest 20 mg of saffron taken daily for 3 months to one year may modestly improve retinal sensitivity to light and visual acuity in men and women with early age-related macular degeneration, although only one of these studies had a placebo control (Falsini, Invest Ophthalmol Vis Sci 2010; Piccardi, Evid Based Complement Alternat Med 2012; Marangoni, J Transl Med 2013). Saffron contains antioxidant carotenoids, such as crocin and crocetin, and other compounds, such as safranal, which are thought to be responsible for some its beneficial effects. Standardized saffron extracts such as Satiereal (standardized to 0.3% safranal) have been studied and promoted for other uses, such as appetite control (Gout, Nutr Res 2010). (See the Encyclopedia article on Saffron for more about additional potential uses). AREDS: A large study known as AREDS (Age-Related Eye Disease Study) evaluated the effects of a combination of supplements on eye health. This study did not evaluate lutein or zeaxanthin. It evaluated the effect of taking zinc by itself or taking a combination of vitamin C, vitamin E, beta-carotene, and zinc. The study found that zinc alone or the combination of zinc with vitamin C, E and beta-carotene can slow the progression of age-related macular degeneration when taken on a daily basis. The supplements reduced the risk of progressing to advanced age-related macular degeneration by 25% over a period of 5 years compared to a placebo. The tablets used in AREDS were manufactured to contain the following minimum contents throughout their shelf-life: 7,160 IU of vitamin A (from beta carotene), 113 mg of vitamin C (ascorbic acid), 100 IU of vitamin E (dl-alpha tocopheryl acetate), 17.4 mg of zinc (zinc oxide), and 0.4 mg of copper (cupric oxide). It's important to note that the reason for copper in this formula is not to promote eye health, but to prevent copper deficiency due to the high amount of zinc in the formula -- zinc can reduce copper absorption (see Concerns and Cautions below). AREDS 2: In May 2013, results from the AREDS2 (Age-Related Eye Disease Study 2) study were published. This study was similar to the first AREDS trial, but sought to test variations of the original supplement formula. Researchers evaluated the original AREDS formula and added either 10 mg lutein and 2 mg zeaxanthin, 350 mg DHA and 650 mg EPA, or the combination of lutein+zeaxanthin and DHA+EPA. In addition, some people in the study received the original AREDS formulation, but with some slight modifications. One group received a version with a lower dose of zinc - 21.8 mg of zinc (25 mg zinc oxide) instead of the original 69.6 mg (80 mg zinc oxide). Another group received a version without beta-carotene. And a third group received AREDS with the lower zinc dose and no beta-carotene. Adding lutein and zeaxanthin to the original AREDS formulation provided no additional benefit overall; however, in people with very low dietary intake of lutein and zeaxanthin the addition of these ingredients reduced the risk of disease progression by about 36% compared to the original AREDS formulation. The addition of omega-3 fatty acids (from fish oil) provided no additional benefit. Adding the combination of lutein and zeaxanthin plus omega-3 fatty acids provided no additional benefit. Substituting lutein plus zeaxanthin for beta-carotene in the original AREDS formulation might offer additional benefits. An exploratory analysis of study data suggests that using lutein plus zeaxanthin instead of beta-carotene reduced the risk of disease progression by about 18%. Using the lower dose of zinc (21.8 mg) in the AREDS2 formulation was just as effective as the higher dose of zinc (69.6 mg) used in the original AREDS formulation. Removing beta-carotene from the original AREDS formulation also did not impact the risk of disease progression. This is good news for smokers and former smokers since beta-carotene can increase the risk of lung cancer, strokes and death from heart disease in these groups. Lutein supplementation appears to be safe at a dose of 10 mg. A six-month study using 20 mg of lutein also showed no safety problems (Bahrami 2006). However, a study based on subject's memory of the previous 10 years suggests that long term use of supplementation with lutein as well as vitamin A (from beta-carotene or retinol) was associated with an increased risk of lung cancer (Satia 2009). Long-term use should not be recommended for lung cancer prevention, particularly among smokers. Simultaneous consumption of the fat substitute olestra, found in fat-free chips, may decrease the absorption of lutein and zeaxanthin. Beta-carotene from food and supplements may also decrease the absorption of lutein, zeaxanthin, and astaxanthin. More information about the uses and clinical studies with lutein and zeaxanthin is found in the Encyclopedia on this website. 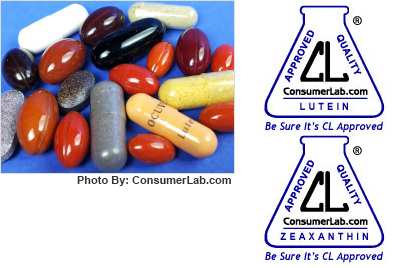 To further assist consumers, ConsumerLab.com licenses its flask-shaped CL Seal of Approved Quality (see The CL Seal) to manufacturers for use on labels of products that have passed its testing. ConsumerLab.com will periodically re-evaluate these products to ensure their compliance with ConsumerLab.com's standards. Information on this site is provided for informational purposes only. It is not an endorsement of any product nor it is it meant to substitute for the advice provided by physicians or other healthcare professionals. The information contained herein should not be used for diagnosing or treating a health problem or disease. Vision Supplements Review (with Lutein and Zeaxanthin)! *We do not sell or share your personal information with anyone else, ever. † Membership fee required for full benefits.